Christian, husband, brother, friend, hobbyist. After speaking with @Seattle_Aquarist @burr740 @Maryland Guppy and @Greggz I've changed my dosing regimen to use a bit less Equilibrium and 1/2 tsp of Epsom Salts (Mg sulfate) to fix my low Magnesium problems, and help with my excessive K level after I attempted to get a higher Mg dose through Equilibrium alone. I'm still dosing very low on Nitrate (2 or 4 ppm cant recall at the moment), and watching my feeding closely to see when my Nitrate levels get more manageable. I suspect most of my minor algae issues are still due to my stocking level creating a high organic load in the water column. I cleaned my canister filter out last weekend and it was... dirty. 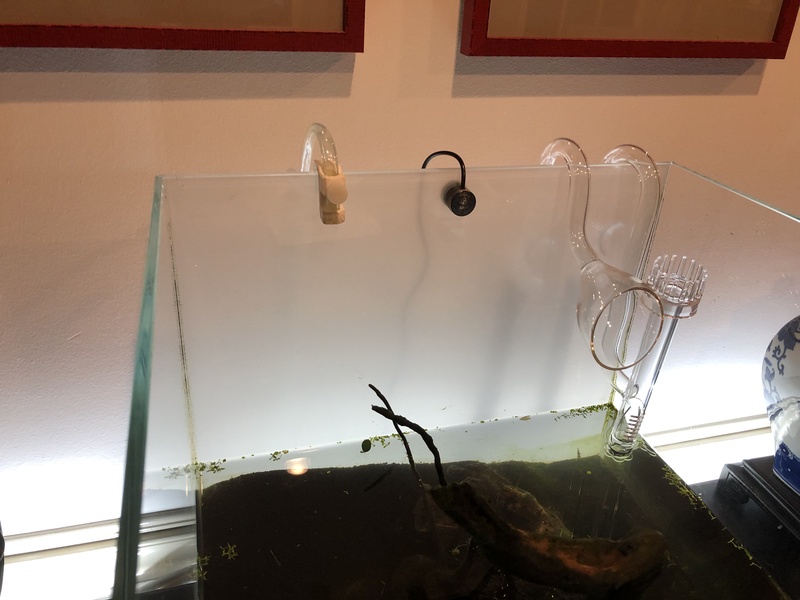 I'm not sure what to make of things, but it seems like after I removed a large amount of salvinia minima and cleaned the filter, my surface scum got worse. It may be that the salvinia was helping to eat up the high organic load, or that the absolute raft of oxygen bubbles they created helped to oxygenate the bacteria that processes them. Either way I may try cleaning up again this weekend, and putting my fish on a week long fast to see just how much TDS increases without feeding, and then see how much it increases once I return to feeding 2-4 times a week. When I get the chance I'll add some more photos. My rocks are starting to bleach from the lower pH due to the addition of the CO2, and most of the algae is gone, but I've still got a few tufts of BBA, something like clado or staghorn, and something brown growing on my anubias leaves. My tank is 14" high and most glass lily pipes with skimmer are around 12" as you said. You can always raise it a bit but they look a bit too bulky for my taste. I use an Eheim 350 nano skimmer to clean up the surface from time to time (after trimmings) that would work for you. I also have this acrylic inflow with skimmer https://www.aliexpress.com/item/aqua...725117348.html (Its only about 8 inches in length or so). I adjusted my CO2 a bit too high and nearly gassed my fish. Woops! Thankfully a friend in the hobby was chatting with me when I first noticed and could immediately recommend a water change. I did a quick 30% WC siphoning the surface film and adding in some cooler temperature water to help as well and everyone was fine. Thankfully it was the very end of my injection period so it hadn't been like that all day long. I'm still struggling to balance how long it takes to get my pH up prior to lights on with my Rex Grigg's style reactor. It can take multiple hours for the gas to get to a high enough volume that dissolution is at peak rates, and once lights kick on the CO2 continues to rise but more more slowly. Eventually I'll have things high enough prior to lights on and rising slowly enough that they should stay steady. This would be a LOT easier with a pH monitor to give me a chart of daily numbers every 15 to 30 minutes. I've also noticed some people are using flow meters to measure CC's of CO2 as opposed to bps, which seems so much more practical that bps seems quite idiotic by comparison. The bubbles are different sizes depending on the liquid they form in, and the speed they are made, and the diameter of tube they exit from, AND the angle at which they exit. I'll have to look into getting one. I've looked into this myself, same size tank. I still want one, but it's tough finding one that measures the very low flow I would have through it. That being the case, I've just been adjusting based on the Apex pH readings. I can't recommend enough even an Apex Lite for this application. I feel like they pay for themselves with just real time pH monitoring alone. Add all the other functionality you get and it's just a no-brainer investment for almost any tank IMO. Greggz and Blacktetra like this. Looks like Apex Lite is no longer being manufactured. I'd love to have one but the Apex LE (I think that's their next generation entry level device on the website) is $500. And as it stands I'm at a point where I want to get the most out of my tank and equipment for the next year or two at least before making another big investment. I'm talking with another forum member about their use of a Hanna instruments pH testing pen, and will likely go that route. Honestly, it's a bit maddening how most of the problems in this hobby are solved by throwing hundreds of dollars at the situation. As of the last few days I've been monitoring my pH level at lights on and lights off on my tank, and the API drop tests look identical in color, so at least my CO2 level is steady now. Time will tell if that's "dialed in" enough to help kill off the BBA, but so far it's not spreading or going away. I hear you, but for some reason we seem to think about this hobby differently than other hobbies when it's really not. I like woodworking. Could I build something nice with basic tools? Sure. That said, if I want to make something truly amazing I need a table saw, band saw, miter saw, drill press, joiner, planer, router table, lathe, belt sander, dust collection, etc. That stuff is thousands and thousands of dollars. Could I get a nice car for 30k? Sure. If I want to race competitively, now I'm looking at 100K plus. Could I play golf with Walmart clubs? Sure. Will I be able to get the most out of my game without spending hundreds on decent, name brand equipment? Nope. Every hobby is expensive, and every hobby takes money to get to the next level. It's just the nature of the beast. Aquarium keeping is no different. Now I say that, but it is vitally, critically important to understand that just throwing money at it WILL NOT take it to the next level. You need the passion and personal investment to get there. A lot of people fall in that trap, thinking that "if I just spend tons of money it will be easy". It's not. Anyway, FWIW, I have two slightly older full Apex systems. I bought both used, both were less than 300$ total for the entire setup and both have run flawlessly. Something to think about. I hear you, but for some reason we seem to think about this hobby differently than other hobbies when it's really not...It's just the nature of the beast. Aquarium keeping is no different. Not all hobbies are cash sinks to the same degree, but I recognize that hobbies are basically about spending money to do something you enjoy. I think my point is that I'm not currently at a place where buying an Apex system would give me enough joy to justify the price. Now, that being said, you've got me pretty interested, and should I spend a year or two with my now high-tech tank, I'm sure during that time I'll be planning something bigger, fancier, and better planned out. But for now, I'm happy with buying a $50 pH pen and using it enough to get my CO2 dialed in properly so I can get back to just following a set routine and enjoy watching things grow. That's the part of the hobby I enjoy. I enjoy research, and I enjoy planning, but I like when things are finally running as you want them to. That's where I find satisfaction in this hobby, and where I get the energy and stones to decide I want to do more, better, and more beautiful. In sum, I'm not saying "no way, that's a dumb investment" I'm saying "cool, I'll start putting aside a few dollars for it, along with my rimless tank and stand budget." Like what you've got going with yours in your beautiful journal build. Getting CO2 where I want is more complicated than I'd realized for a Rex Griggs reactor. If I add CO2 slowly, the amount of gas dissolving is small, and my CO2 raises slowly. If I add gas quickly, the amount of dissolving gas is higher and I get a faster rise of CO2. To keep CO2 steady during the day I need to reduce my CO2 rate until the amount registering at the start of the photoperiod is very close to the amount at the end. But to have enough CO2 at the start I have to get my CO2 injection started at least 2 hours in advance to let it sloooowly climb up to the level desired. I can see why people say having some flux is good. If I had greater surface movement than my canister filter can provide, I would off-gas a bit faster, leading me to be able to increase injection rates, so I wouldn't need to have CO2 running for so long prior to lights-on. I'm still experimenting with lights-off and gas-off timing as lowering my injection rate means I have a smaller volume of gas in my reactor at the end of the photoperiod, which means I need to have the gas shut off closer and closer to the end of the light period. So many things to juggle. Haha, we are almost opposite. I like the setup, building, tinkering, etc. Once it's running well and it's just a matter of routine work, it starts to bore me a bit. I can totally understand where you're coming from, though. I'm also not suggesting you need to spend a ton of money to succeed because you don't. Lots of people run really great low tech, low budget tanks. There are times certain things become prohibitive, though. I've currently got a Landen 60P in my Amazon cart just waiting. When I bought my CO2 regulator I waited until I could get either a stainless or nickle clad model for less than $100. I like the pretty things as I'm able to afford them, and in time, Lord willing, I'll own all the parts at once and have a very nice display tank I hope. One with a super awesome controller for monitoring pH and TDS and managing my CO2 and using peristaltic dosing pumps for ferts. I like the idea of having a sump (with Bean Animal overflow like yours of course) to act as an auto top-off system (since it keeps display tank water level locked in place). But I'm a bigger fan of the all-glass look possible with rimless tanks that use glass lily pipes. But I'm also terrified of owning said lily pipes because they require regular cleaning, and are made from glass. I'm not sure how much force it takes to break them, but I'm sure I would break one eventually which would be both sad and dangerous, even if a replacement is only $40. That being said I have stainless steel pipes in my Amazon cart too, just waiting. But still... I hate when the top inch of glass gets all gross and foggy as my water line drops. If you do a black background it's easy to do with something like a coast to coast, Calfo external overflow design. If you want all clear on all sides, it certainly becomes tough to hide the overflow and return pipes. You may be able to hide a couple float switches in the tank itself and top off straight into the tank. That said, realistically you will still have 0.5 to 1 inch of level fluctuation. It uses an electronic eye to detect the water level. It also has some smart logic built into it that will kill the ATO pump if it runs for more than 3x the time it normally takes to run, to prevent a flood in case of a sensor failure. The Autoaqua Smart ATO Micro 120P is the least intrusive option I was able to find. Well that is certainly better than anything I had imagined. Though also a bit terrifying. Software and hardware failure are things I've spent too much time with to feel confident there. In other news my CO2 is finally stable through my photoperiod so I expect algae to slowly reduce. I've purchased a super cheap skimmer (less than $10 shipped) that should arrive soon. Then I can begin the process of calibrating CO2 all over again. My gas exchange is pretty horrible with surface scum covering everything. To keep CO2 steady I had to lower it a lot, then set it to run almost 24 hours straight. I'm sure that having a skimmer will increase flux and I'll have a lot more CO2 loss from my surface agitation, and then I'll have to readjust things. Crossing my fingers I remember to reduce CO2 a lot and monitor things regularly the day I finally install the skimmer. I don't plan to use this setup continuously, but I am going to use it to optimize CO2, then check it throughout the day occasionally to make sure that everything is okay. Total cost (with a good pH probe from Bulk Reef Supply) is about $160.